Designed for those new to SUP, we provide quality SUPs and lifejackets. Cost: $15 pp tax included. 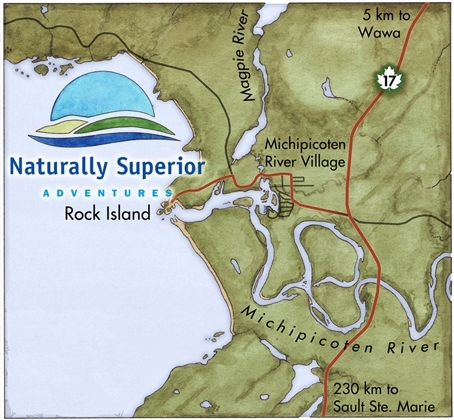 This guided interpretative tour by Canoe follows the river from the Highway 17 crossing down past Buck’s Marina and Silver Falls ending at Naturally Superior Adventures at the mouth of the Michipicoten River. Plan on 1.5 – 2.5 hours. Logistics: Leave your car at Naturally Superior Adventures and we’ll shuttle you with canoes and gear to the tour start. You’ll finish at your vehicle and Naturally Superior Adventures. Bring water, snack, sun hat, shoes that can get wet and dress according to the weather. Tour includes van shuttle, fully outfitted canoe, lifejackets, safety equipment and experienced guide/instructor. Join us from our base at the mouth of the Michipicoten River for a 3-hour tour of the Michipicoten River and area. We’ll cover basic paddling skills as we head up the Michipicoten River and see Silver Falls (Lower Mission Falls) from below and then Buck’s Marina and Fenlon’s Lagoon and the old Michipicoten Post location. If conditions are right we’ll travel out on to Lake Superior for a brief survey of Michipicoten Bay landmarks. Logistics: Meet at our base at the mouth of the Michipicoten River approx 10 – 15 minutes before start time to meet your guide, settle up with payment and sign liability forms, etc. Once ready we’ll cover safety on shore then get our sea kayaks and head out on the water. Some instruction will be offered during the excursion. Fully equipped tandem canoes will be available for 2-hour rentals from Dr, Rose Beach on Wawa Lake during Sunday afternoon. Reservations are pleased required. Pay at the door. Unfortunately we cannot accept MHS discount coupons for this dinner concert event. We will happily honour and collect $5 dollar MHS discount coupons. Appreciate that we will require that you read, understand and sign our liability form before participating. Print all of this off to save your memory from doing it for you.